When I picked up my new bike, the sales guy mentioned that I shouldn't start the engine until I am ready to ride away i.e. don't start the bike up and leave the engine idling/running while putting gear on etc. Does that sound right to anyone? I know a chap that used to let the engine run all the time, the theory being that it warms the engine up. Re: Is leaving the engine idling on start up bad? Just had the 600 mile service on mine. With mine just ran it whilst putting on helmet and gloves. Then slowly increased the revs whilst the engine warmed up. With current engine oils they are thin when cold and increase in viscosity when warm so no need to warm oil before riding off. Don’t forget the temperature gauge is the water and not the engine. My current car has both and in the current weather water temp is normal in around 10 minutes of driving but the oil is around 10 minutes after that. So don’t redline till you’ve got a few miles under your belt. There is no need to idle/rev the engine for any amount of time. Better to warm everything up together as you ride. I get suited up, get on the bike and go. 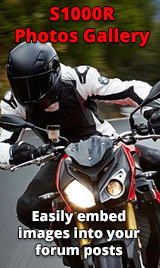 There is no requirement to idle the bike excessively prior to riding (as has been discussed at length here: https://www.s1000r.co.uk/index.php/topic,7814.0.html) but it's a liquid cooled bike, it should not cause any problems if you do so.